"Just pick up all the crap that's lying around." If you ask the inn keeper in Peasantry why you can't pick up ye flask, the inn keeper asks Strong Bad why he wants it. 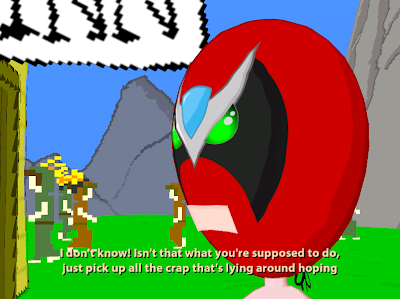 In another critique of the adventure genre, Strong Bad replies "Isn't that what you're supposed to do, just pick up all the crap that's lying around hoping it will be useful for some stupid thing later?"